We see signs of fall all around us! Have you checked out the fall colors in Carbondale yet? A fun way to view the fall foliage is driving the West Elk Loop Scenic & Historic Byway. This scenic byway, also called the Ruby Route, after the Ruby Mountain Range, connects Carbondale with Crested Butte and all of the towns in between. One forest ranger described the West Elk Loop as the “closest you can come to a wilderness experience in a passenger car.” We agree! So, get the family together for a fun road trip through the mountains this fall. 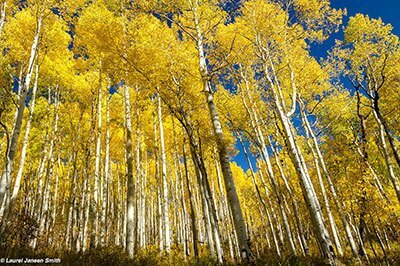 Along this 205-mile loop ― which takes 6-8 hours to drive ― you’ll pass through thousands of acres of National Forest lands filled with colorful aspen trees turning orange, yellow, and red. You might also spot wildlife, like elk, mule deer, bighorn sheep, or mountain goats. Bring your binoculars to get a closer look, as you might scare them away by stepping out of your car! Let’s begin our journey on the northern section of the West Elk Loop just outside of Carbondale. Drive south out of Carbondale on Highway 133. In 16.5 miles from Carbondale’s roundabout, you’ll arrive at our first stop, the town of Redstone. The first town in the Crystal River Valley is Redstone. Stop here to walk along the main boulevard lined with shops, galleries, and restaurants. Also, tour Redstone Castle, the former home of John Osgood, who founded Redstone in the late 1800s. 11 miles down the road from Redstone is Marble. This small mountain town’s claim to fame is providing the marble for the Lincoln Memorial in Washington, D.C. Drive around, and you’ll see marble slabs large and small everywhere. While you’re in Marble, visit the studios of some local marble sculptors. Next, drive up and over McClure Pass. Now that you’re over McClure Pass, you’re now in the North Fork Valley, home to Paonia and Hotchkiss. Paonia is known as the “farm-to-table capital of Colorado”, so you don’t want to miss out on late harvest organic fruits and veggies. In Hotchkiss, visit the Hotchkiss/Crawford Historical Museum. View their barbed wire exhibit, and learn how putting up barbed wire changed ranching in the Western US. Also, check out photographs of the town’s history, Ute artifacts, and period clothing from the pioneer era. Our next stop is Crawford State Park, located 12 miles from Hotchkiss. Visit Crawford Reservoir, and go on a hike on the Indian Fire Nature Trail, a 1-mile loop. To get to the trailhead, drive out of Crawford for 3 miles, and make a right on Black Canyon Road. From there, drive another 1.4 miles, and turn right into the parking area. Next on our list of stops is the Black Canyon of the Gunnison National Park. Drive the Black Canyon’s North Rim. Along the way, you’ll spot marked overlooks, where you can park and go on a short, easy hike to view this spectacular canyon. From the Black Canyon, drive 62 miles to Gunnison, CO. Visit the Gunnison Pioneer Museum. Learn about ranching and homesteading in the late 1800s and early 1900s. Also, view the dozen or so historic buildings they have on site, which include a train depot with its own steam train! Located 13.8 miles north of Gunnison is the Roaring Judy Fish Hatchery. In the fall, you can learn about and watch egg fertilization of Kokanee salmon. From the fish hatchery, drive 13.9 miles to Crested Butte. Now, you’re at the last town of our driving tour! At Big Mine Park in Crested Butte, check out the old coke ovens from the town’s mining days. Then, view the Mountain Bike Hall of Fame at the Mountain Heritage Museum. Before you complete the West Elk Loop go for a hike or a mountain bike ride in Crested Butte. From Crested Butte, drive 7.2 miles to the top of Kebler Pass, which closes in the winter. Located at 10,007 feet, Kebler Pass joins Highway 133 at the Paonia Dam. Before you head back to Carbondale though, go fishing or have a picnic at Lake Irwin. To get to Lake Irwin, make a right on CO Road 826, located 0.7 miles from the top of Kebler Pass. Then, drive another 2.2 miles to the picnic area at the lake.